This entry was posted on May 29, 2013 at 5:38 am and is filed under misc. You can follow any responses to this entry through the RSS 2.0 feed. You can leave a response, or trackback from your own site. I don’t ever recall having one of these when I was a kid, although we had the perfect location as a steepish road ran past our house where one would be able to get up some speed. Despite the fact we lived in a very English part of Wales we used the Welsh word Gambo for such a vehicle. A good read, nice to reminisce fondly about our care-free times of the 1950s. 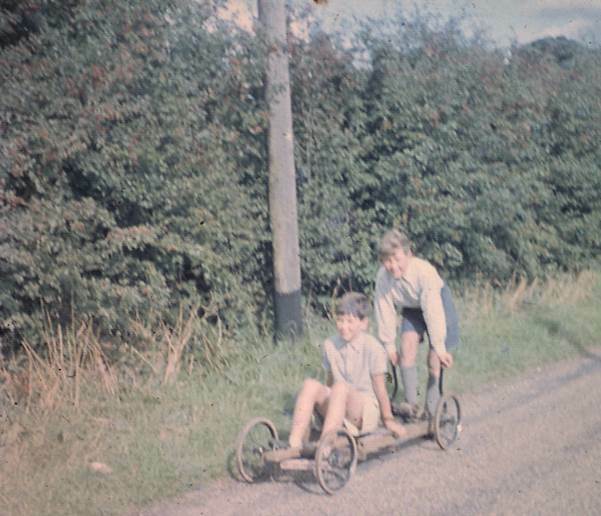 We used pram wheels. No steering, blooming dangerous but a lot of fun until we ‘pranged’ it against a garden wall. No name for kart, but you’ve got to like ‘Prang’! Always fun but steering essential. You coud mount pram wheels so that you could steer. That’s what we did.